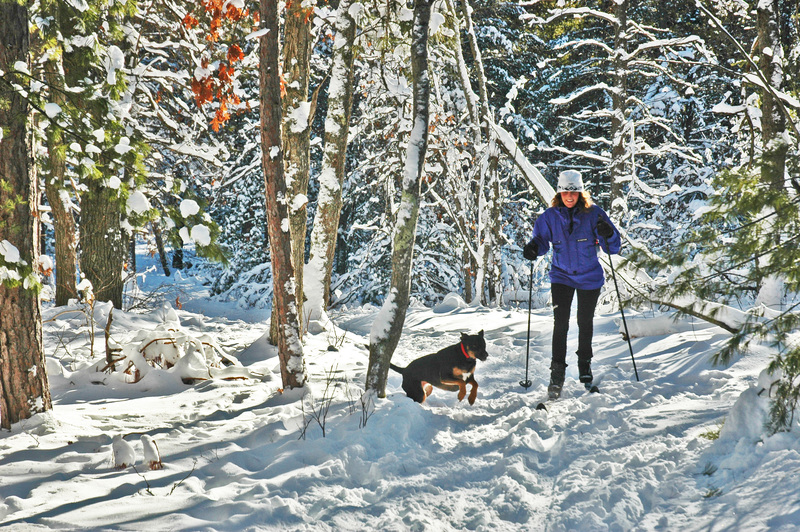 A skier and her canine companion enjoy the trail at Sand Lakes. New Year’s is all about looking ahead, but sometimes it helps to take a little glance at where you’ve been. 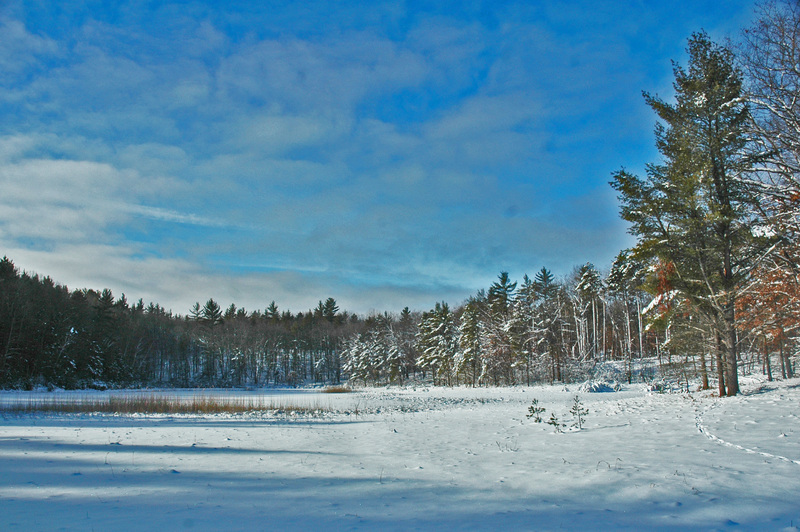 Sand Lakes is where I did my first serious backwoods skiing back in the late 1970s. I think most of us did, actually; back then, there really weren’t a lot of other options. On winter weekends it seemed as though every Nordic skier in the Traverse City area would take the long drive out past Williamsburg to Sand Lakes for a couple of hours of skiing. A lot has changed since then. Lots of new trails have been developed much closer to town, and many skiers (especially the ones who race) prefer a wide, groomed surface to a narrow track that winds among the trees. The state Department of Natural Resources no longer does much in the way of trail maintenance at Sand Lakes, and the place is gradually becoming wilder and less visited. It’s still a lovely place, though – and the quiet is still a big part of its allure. Heading out from the trailhead at Broomhead Road, it wasn’t long before the only sound I could hear was the wind in the trees, the call of an occasional chickadee and the whisper of my skis on the snow. The sun cast zebra stripes of blinding white and glacial blue along the trail, and I could smell the distant perfume of a pinewood campfire. And although it wasn’t the hub of activity it once was, the place was far from deserted. There were other skiers, snowshoers, even hikers (since the snow was still shallow enough for casual walking). 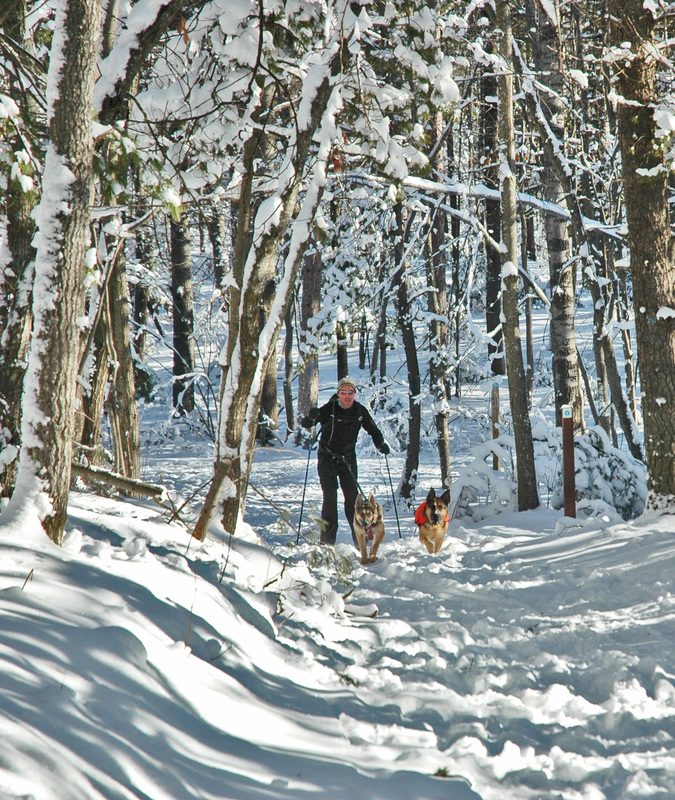 Halfway down the trail I ran into an old acquaintance, “silent sports” guru Georg Schluender -- who was out skijoring, a sport where you harness yourself to a well-trained dog or two and let them tow you through the woods. Georg Schluender skijoring with two well-trained employees. Georg warned me that there was rough trail ahead. The heavy wet snows of mid-December had bent down most of the young pines that grew in the forest, and many of them now across the path. Foolishly, I took this advice with a grain of salt and ended up picking my way through a good three miles of unbroken trail. The roadblocks were beautiful in their way – each tree a gentle snow-covered arch – but impossible to budge. You had to go over them, under them or around them. “Over” is kind of tricky on skis. “Under” is great when it works, except for the globs of thick snow that inevitably go down the back of your neck. “Around” is only good when you can slip in between the bending trees in a sort of zig-zag. And on a downhill slope, unless you like the idea of impalement, the best thing to do is take your skis off and walk. Suffice it to say that by the time I reached the better-traveled end of the trail I had worked off most of my misbehavior at the Christmas dinner table. In spite of all this, the experience was oddly satisfying. There’s something special about breaking trail. And here in this wild corner of the forest, in spite of its great trees and great silences, I could still see the signs of long-ago human activity: beautifully graded century-old logging roads that ran through the woods like Mayan sacbeob, slowly surrendering to the small tress that had begun to colonize them. It got me thinking about all the other places in the Traverse City area that might actually be wilder and more remote now than they were 20 or 30 years ago. In addition to the areas where wilderness is undeniably disappearing, it occurs to me that there are places where things may actually be moving in the opposite direction. And I just might start seeking them out.